Howard Ward‏ @hwardward – The eurozone’s waning fortunes reflect a drastic turn of events from just two years ago. We are not immune from what happens in Europe. The Eurozone is largest economic block. Now to the source of many of the world’s troubles. The host of the clip below asked ECRI’s Lakshman Achuthan – is Chinese economy slowing relentlessly? “In a word – Yes“, replied Achuthan. The trouble with understanding commodity indicators comes from risk appetite & market movements. For example, Copper rallied by 1.4% this week while global economic forecasts were being downgraded. Achuthan addressed this by separating exchange-traded indicators from non-exchange traded indicators and said that these non-exchange-traded indicators are still falling with no uptick in sight. Ok but isn’t the US economy immune from this global slowdown? David Rosenberg‏ @EconguyRosie Feb 5 – What an ISM non-manufacturing PMI report! The share with growth plunged from 94.4% in Sept to 50% now. Lowest since January 2016. The share contracting came in at 44.4% – only surpassed this cycle at this time of year back in January 2010 and 2016. But falling rates should be good for housing growth, right? 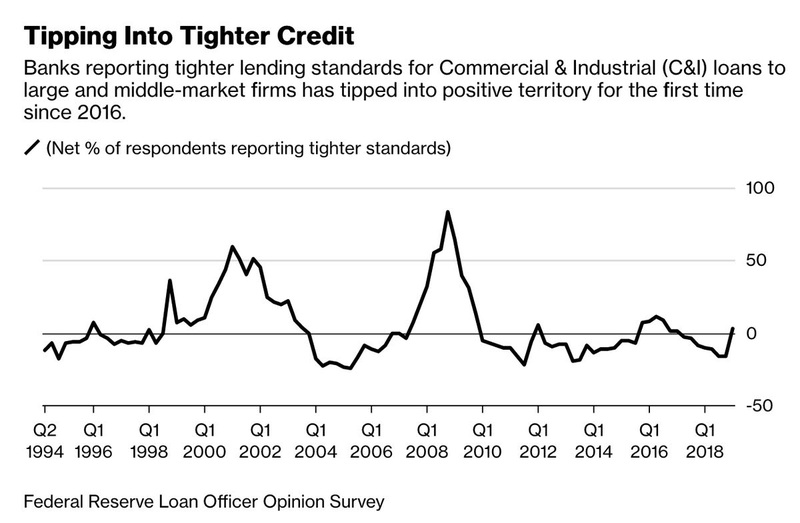 David Rosenberg‏ @EconguyRosie Feb 6 – The definition of pushing on a string is when mortgage rates dive to 10-month lows and mortgage purchase applications still manage to drop for three straight weeks and down 1.8% from year-ago levels. Is there one bank that reflects all of the above? The entire 1-9 year German Bund curve is now NEGATIVE. The 10-year Bund rate could go negative with another week like this past one. The Japanese 10-year has already gone negative. So what? 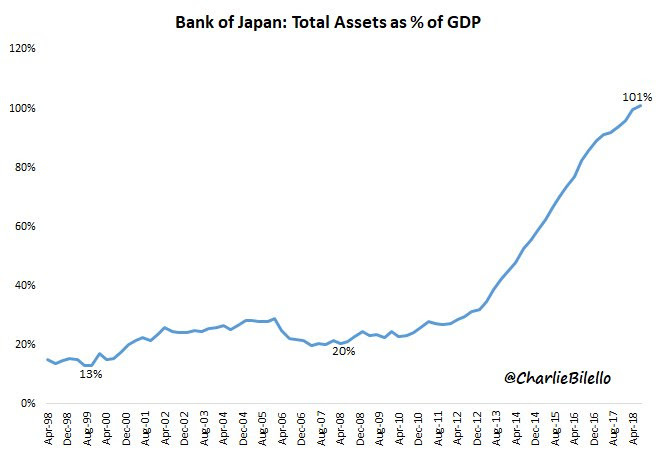 Bank of Japan will do more QE & buy more assets? 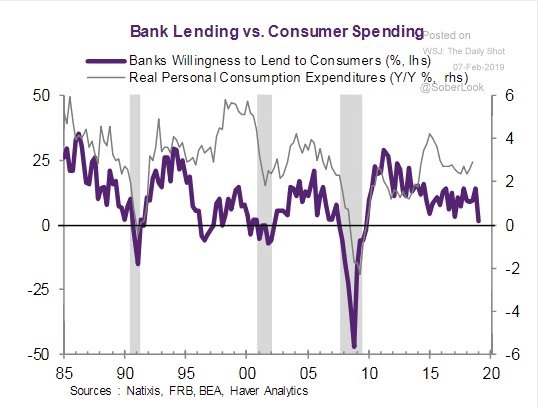 But we don’t need to worry about that because our Fed is still focused on QT, right? Jeffrey Gundlach‏Verified account @TruthGundlach– Fed says it is currently discussing using QE as a regular tool, not just during “emergencies” or when the Funds rate is at the “zero bound”. Man, even a rustler in the wild west could not change a “T” brand into a “E” this fast. So why doesn’t the FOMC cut interest rates in the March meeting? Oh yes, that paramount focus on maintaining “credibility” of the Fed ! Why are we so sure about the Fed not cutting rates soon? Because the 1-year Treasury yield stays resilient while the the rest of the Treasury curve keeps falling below the 1-year yield. The 5-year yield closed 9 bps below the 1-year yield while the 7-year yield closed at the 1-year yield. And yes, Treasury rates melted across the curve this week with 30-year & 10-year rates falling by 5.6 bps, the 5-year falling by 6.7 bps and even the 2-year falling by 4.5 bps. Next Friday marks the end of the 3-week window for the bipartisan panel to deliver “border-wall” funding. And two weeks after that comes the increase in tariffs to 25% on Chinese goods. And this week’s new wrinkle is the planned removal of current zero% tariffs on a range of Indian exports to the US. Might there be a method to all this? Better to get all this now to slam the US & global economy in the next month & next quarter. Elevate the pain to such a level that the bounce back in Q4 & 2020 can be robust with the Fed lowering rates aggressively & a worried Congress working with the President to pass a blue-collar infrastructure program. So what do stock investors do in the mean time? Finally we found a bullish strategist who said clearly – we will go into a bear market if we don’t get a rate cut. 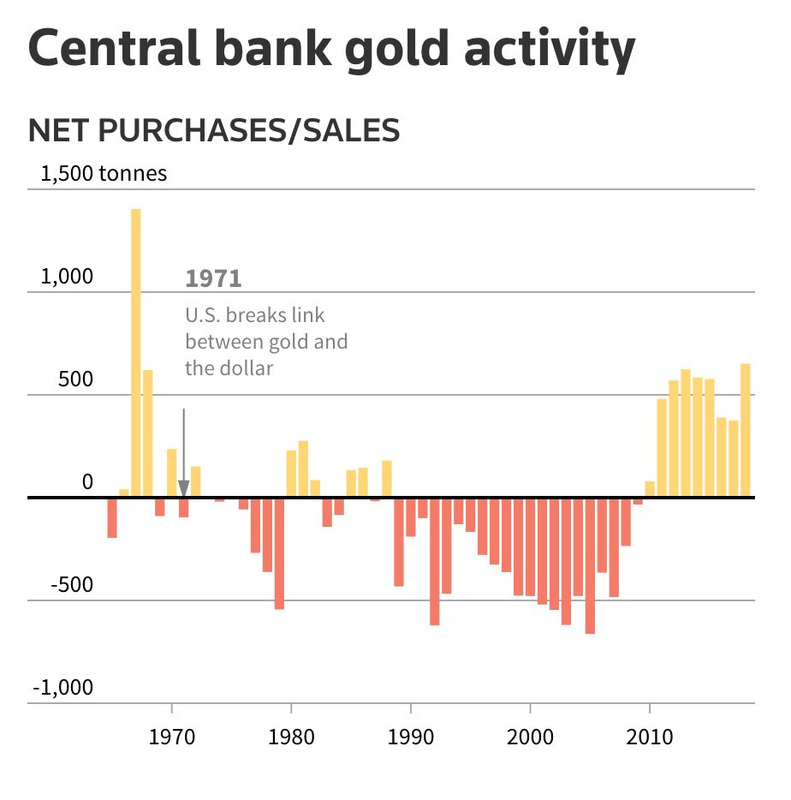 His thesis is simple – the global synchronized slowdown we are seeing will result in central banks turning to easier money globally. He points to 1995 & that year’s tariffs against Japan & EM weakness led by Mexico. So what led the huge 1995 S&P rally – two rate cuts by the Greenspan Fed. That “somehow” was a 8-handle vertical love in the last few minutes. Bob Lang‏ @aztecs99 – spx rallied up to finish green, vix fell again and closed below the 200 ma, volume was poor and there is a lower low and lower high today. going to be tough going over the next couple weeks for the bulls it seems. 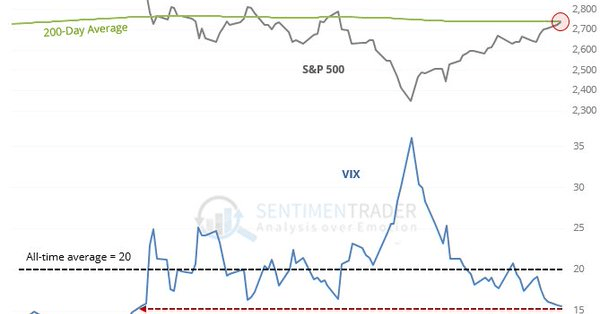 SentimenTrader‏Verified account @sentimentrader Feb 7 – It has rarely been a good sign when the VIX drops so much during a downtrending market. 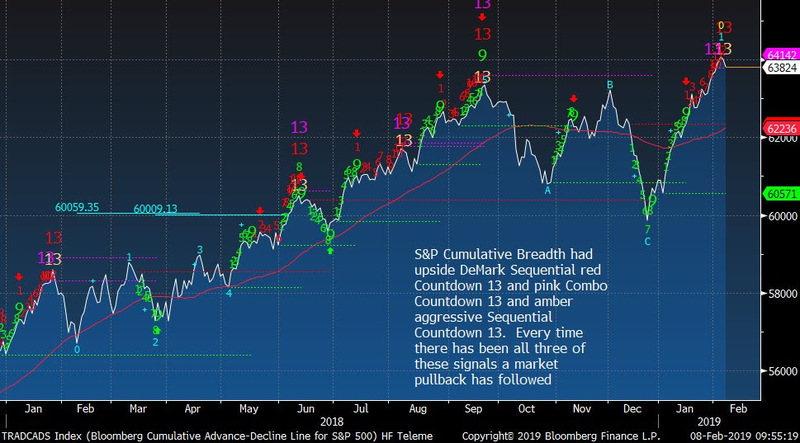 Thomas Thornton‏ @TommyThornton – $SPX cumulative breadth with upside DeMark Sequential, Combo Countdown 13 exhaustion signals. 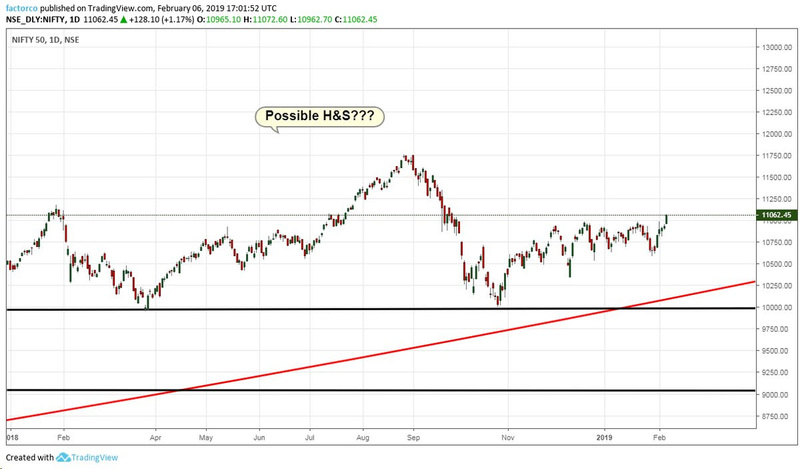 A market pullback is expected. More on today’s Hedge Fund Telemetry Daily Note. The Dollar had a terrific week. $DXY was up over 1% on the week and regained the key 96 level. What did that do to the conviction that EM was going to trample the S&P 500? EEM fell 1.3% on the week with Brazil, China, India & Korea all down. 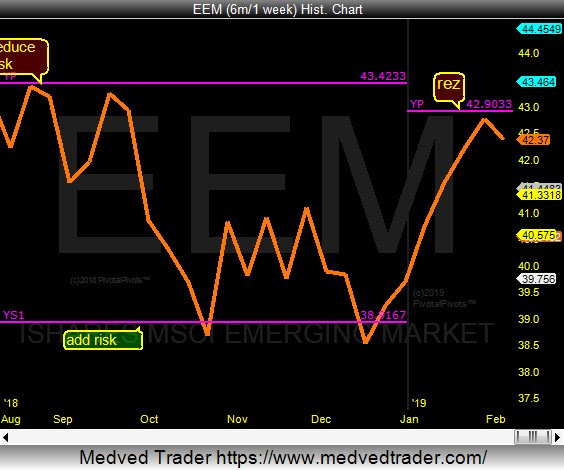 Jeff York, PPT‏ @Pivotal_Pivots Feb 7 – $EEM is starting to pivot at the 2019 Yearly Pivot(YP). 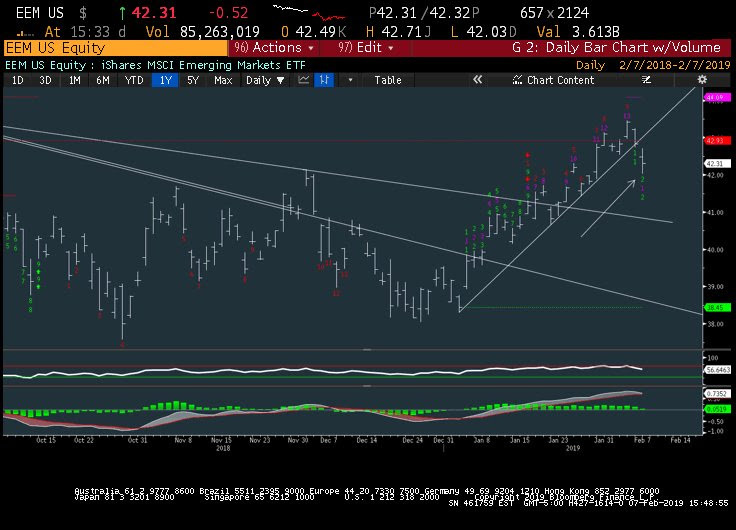 The 2018 low as on the YS1 Pivot. Ys1 to YP=textbook move @PivotalPivots. The Indian Reserve Bank surprised markets with a rate cut. That did lead to a one-day up move. But did that complete a bad set up? Peter Brandt‏Verified account @PeterLBrandt Feb 6 – Factor Trading has taken a 35 contract position in Nifty futures $NIFTY Long or short — what’s your guess? Oil, today’s symbol of risk appetite, fell 4.8% with OIH down 4% & XLE down 3% on the week. On the other hand, Gold was merely down 45 bps with Gold Miner ETFs down about 70-80 bps on the week. Is there a steady buyer underneath?